This Pop! 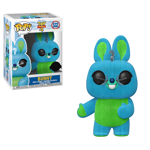 features Bunny, a fun fair prize toy who doesn't take kindly to Buzz. This version has a fuzzy flocked finish. Add him to your collection today!